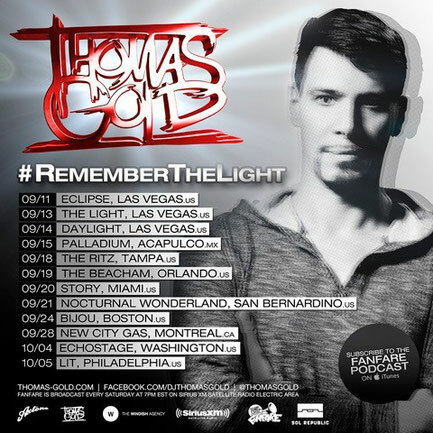 Hot off his Fanfare World Tour, Thomas Gold returns to North America with a brand new single and fall/autumn tour concept. Dubbed “Remember The Light,” the upcoming tour is inspired by Thomas’ imminent Axtone Records single, ‘Remember’, and the key role that light plays in creating a mood for the ultimate live dance music experience. ‘Remember’ is the story of a couple spending the night out and experiencing the beauty of the morning sunrise together. Those who have experienced a sunrise with someone they care about will attest that it’s a memorable moment not soon forgotten. Light of course can mean so many different things, both in the literal sense within the nightclub experience or on a sensory level. “I was thinking back to all my shows this summer and some of the most memorable moments occurred while playing outdoor venues and seeing the sunrise come up behind the crowd. It’s a really powerful moment and going from night to day in such a rapid fashion completely changed the whole mood for everyone. Seeing the sun coming up behind the crowd - especially with all the people dancing - was something to remember!” Thomas Gold says.